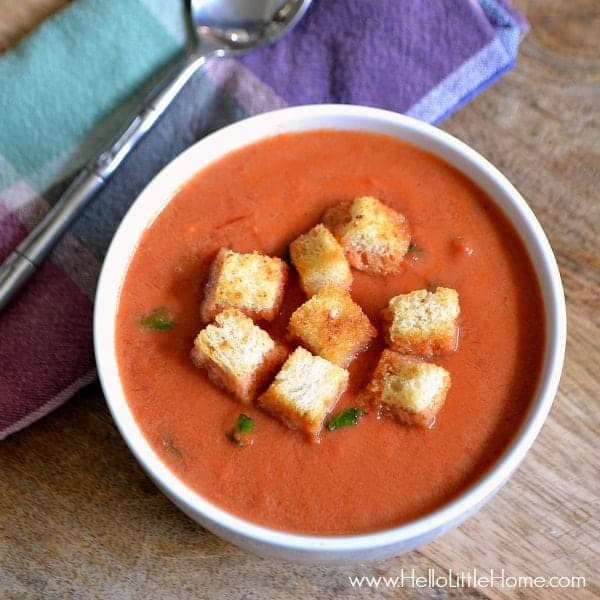 This Creamy Tomato Soup with Garlic Croutons is the perfect cold weather comfort food! Hello, it’s Ginnie from Hello Little Home! Fall has always been my favorite season. After a hot NYC summer, I am beyond ready for cool weather, colorful leaves, and cozy sweaters, not to mention my favorite comfort foods. I love a hot bowl of soup at this time of year, and this Creamy Tomato Soup with Garlic Croutons is definitely worth looking forward to on a chilly fall day! 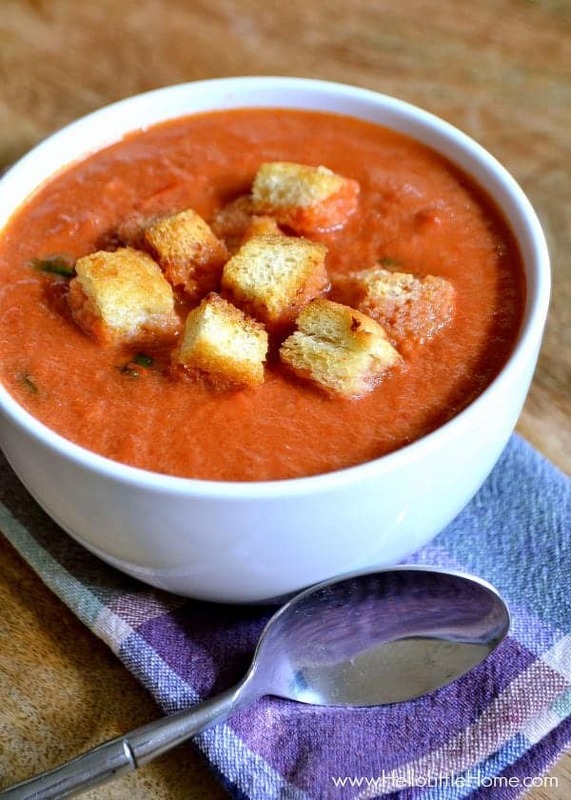 Tomato soup always reminds me of my childhood. Growing up, I ate plenty of the canned variety … paired with a grilled cheese, of course! 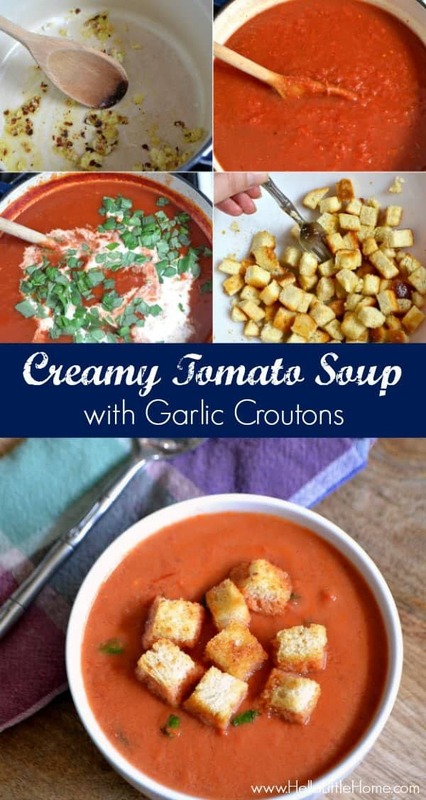 My tastes have changed a bit over the years, and this easy-to-make Creamy Tomato Soup is my new favorite. This recipe uses simple ingredients and comes together really quickly. 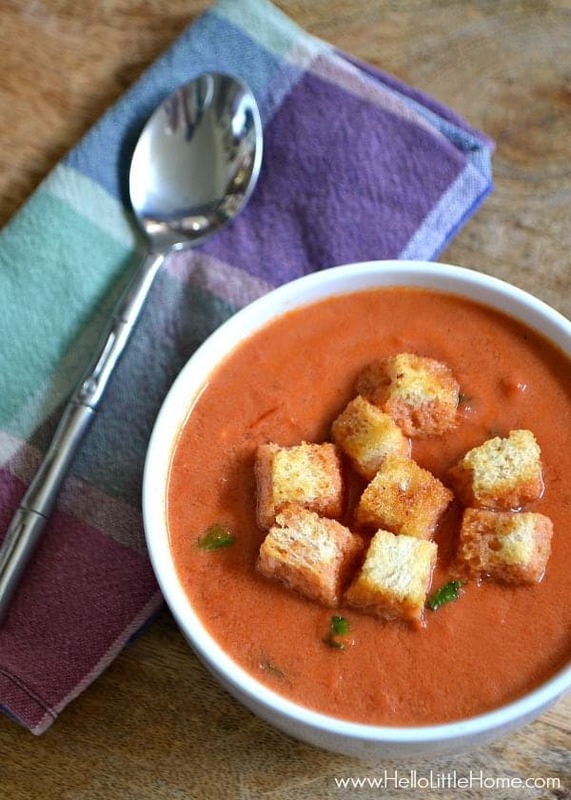 Fresh basil brightens up the flavor, and the Garlic Croutons add a welcome crunch. Lightly spray a baking sheet with nonstick cooking spray, then top with cubed bread. Bake until bread is dried out and beginning to brown around the edges, about 7 - 10 minutes. Remove bread from oven and place in a medium bowl. Mix together butter, garlic, Parmesan, and salt. Pour butter mixture over croutons and toss well. Return croutons to baking sheet and cook until golden brown, about 5 - 10 more minutes. Meanwhile, combine olive oil, garlic, salt, and crushed red pepper flakes in a large pot. Heat over medium heat until garlic is fragrant. Stir crushed tomatoes and vegetable broth into garlic. Bring soup to a boil, then reduce heat to a simmer and cook 10 minutes. After 10 minutes, remove soup from heat, then stir in basil and cream. This recipe is easy to alter according to your taste. Add more crushed red pepper flakes for a spicier soup, or leave it out if you like things mild. Try experimenting with different herbs or season the soup with your favorite spices (I want to try curry powder!). For a richer soup, add additional heavy cream. Are you watching your calories? Cut down or eliminate the cream … it will still be delicious!